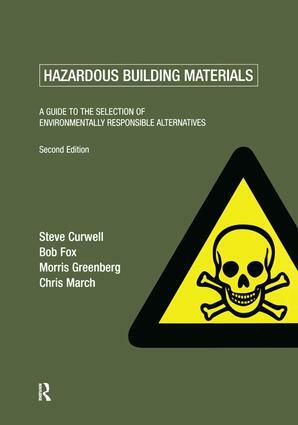 This new edition provides a detailed reference source of the use in residential buildings of materials known or suspected to harm health and the environment. Alternative materials are evaluated using unique data sheets which compare environmental impact, cost, health, safety and technical performance providing building and construction professionals and other practitioners with the facts they need to make the right selection. Hazardous Building Materials considers the following building elements: structure, windows and doors, roofing, insulation, finishes and fittings, pipes, services and services equipment. Based on the highly successful format of the first edition this practical reference provides expert advice with the use of clear drawings, tables and data sheets to architects, surveyors, facilities managers, students on built environment courses, material suppliers, environmentalists and clients.